Cauliflower is pretty much my winter of 2016 hero. I’ve only recently got into cooking with it, and it has made its way into a multitude of different dishes, soups and salads this season. It’s a cheap veggie from the markets, and it easy to grow if you can keep the Cabbage White Moths away. I've been playing around with my Ottolenghi recipes (I'm obsessed!) and thought I'd share this one with you...yes, it's got cauliflower in it. It's a CAULIFLOWER AND PARMESAN CAKE! Ottolenghi suggests serving this “cake” (think: sturdy baked omelet) as a light dinner with a “makeshift salad of sliced cucumber, dill, mint, a little sugar, cider vinegar and grape seed oil”. You can serve it with whatever you like really, steamed greens, snags, or just wolf it down all on its own. It's been lunch box fare all week and is pretty awesome. A good handful of parsley (Ottolenghi suggests basil, but it isn’t in season at the moment and my garden is awash with Italian parsley, so that is what I used). 220 grams of parmesan or aged cheese. I didn’t have quite enough parmesan in the fridge, so topped up with about 70 grams of grated tasty and all was well. Ottolenghi says to boil your cauliflower, but I chose to roast it instead. I broke the cauli into small florets and chopped up the stems too. I tossed the lot in olive oil and a liberal seasoning of salt and pepper. If you choose to do it this way, omit the extra seasoning later otherwise it will be salt overload! Once cauliflower is cooked, preheat oven to (180°C) degrees. Meanwhile, prepare the batter. Halve your red onion and cut a few thin rings off the end of one side; set them aside. Coarsely chop the remainder of your onion. Heat all of your olive oil in a pan and saute the chopped red onion and rosemary thyme together until soft, about 8 minutes. Remove from heat and allow to cool. Whisk eggs and olive oil and onion mixture together. Stir in parsley. Whisk flour, baking powder, turmeric, cheese, (if you have boiled your cauli at this stage add 1 1/2 teaspoons salt and many, many grinds of black pepper together in a separate bowl) and add to egg mixture, whisking to remove lumps. Stir in cauliflower gently, so most pieces remain intact. Line the bottom of a 24cm round springform pan with baking paper. Butter the sides generously. Put the sesame seeds in the pan and toss them around so that they stick to the sides. Pour in the cauliflower batter, arrange the reserved onion rings on top and bake cake in the center of the oven for 45 minutes, until golden brown and set. Serve warm or at room temperature with a crisp white. 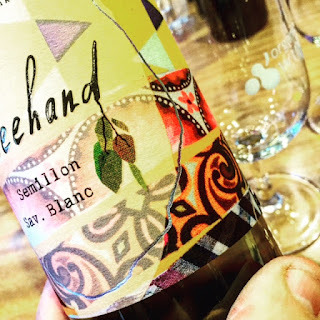 Why not try the grassy Freehand Semillon Sav Blanc? It’s an absolute cracker and you can buy it here!